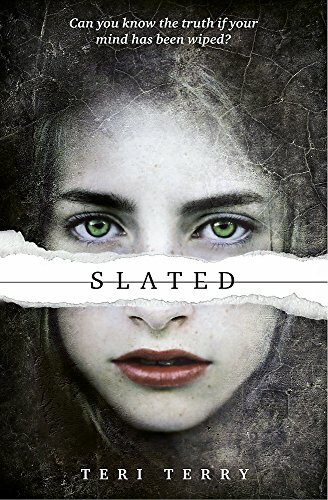 16-year-old Kyla has been ‘slated’ – given a clean slate, a fresh start to redeem a past which has been wiped from her memory. Leaving the ‘hospital’ where she has been processed, she is adopted into a new family and placed in a school alongside – for the most part – unslated students. Slaters must wear a ‘levo’ clamped to their wrists and visible to all, a device allegedly for their own good since it monitors their emotional wellbeing. Fall below 4.5 or so and the levo vibrates a warning; below 3.0, and slaters are heading for a blackout and a recall, maybe into oblivion. So stay happy, play by the rules and don’t think for yourself. Life is not comfortable for Kyla. She is bullied, feeling alone and disorientated. Can she trust anyone? Her adoptive parents and the psychiatrist she sees every week are guarding secrets of their own. Teachers and counsellors declare they are on her side, yet some may well be spies for the system; one or two freethinking teachers are suddenly removed without explanation by the Lorders, the strong-arm agents of the ruthless and authoritarian government. Kyla becomes increasingly aware that somehow, her own slate is not wiped quite clean. Some memories, some skills remain – such as drawing brilliantly with her left hand. Here and there, Kyla finds individuals determined to undermine the regime – whether through terrorism or by tracing missing persons on an illicit website, trying to connect to roots which slaters have been forced to leave behind. Then there is Ben, her fellow slater, with whom she shares a passion for running. The rhythm and speed take both of them beyond the register of their levos and into a reality where they find each other. Ben decides he needs answers. The only way is to free himself from his levo, risking death and risking losing Kyla too. The writing is taut, characterisation and dialogue are sharply individual, cliff hangers are uncontrived, and so we become anxious about the future of the characters in this bleak and threatening world. There is an Orwellian harshness about this dystopia that makes for disturbing and provocative reading.